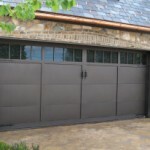 When people are considering garage door installation, they often choose steel. It is strong, resistant and requires minimum maintenance. Though, there are still some differences among steel garage doors depending on their thickness and their ability to protect you would also depend on the frequency of maintenance. The gauge number of steel would determine the door’s strengths: the lower the number, the greater the strength. 24 gauge steel is usually ideal for homeowners, who want a durable garage door that will not be sensitive to dents and will provide better insulation. Higher gauge numbers will certainly cost you less but, they will be more sensitive. The specialists of Homeland Garage Doors Toronto know these little secrets and can protect your interests when you are buying a new door. Traditionally, steel can erode but most steel garage doors today undergo special processing for greater resistance to elements. We can apply a special varnish on your existing steel door to protect it and take care of the required repairs and maintenance for a reliable system.